When I realized that well over a month had passed since I last updated my blog, I was rather shocked! "Where did the time go?" I mused to my SELF. The answer came back swiftly. "Listening to the song in your heart." said that voice of SELF. I smiled. Allow me to explain. Around the beginning of June, I was doing some clean up on my computer. A necessary evil every now and again and not one that I particularly enjoy. However, I like things relatively tidy and a good "purge" of my inbox, bookmarks, graphics, digitals and files definitely cleans things up... at least for awhile. Sometimes I am more "ruthless" in my housekeeping than at other times and this time was no exception. My recycle bin was filling up at a furious pace. But then.... 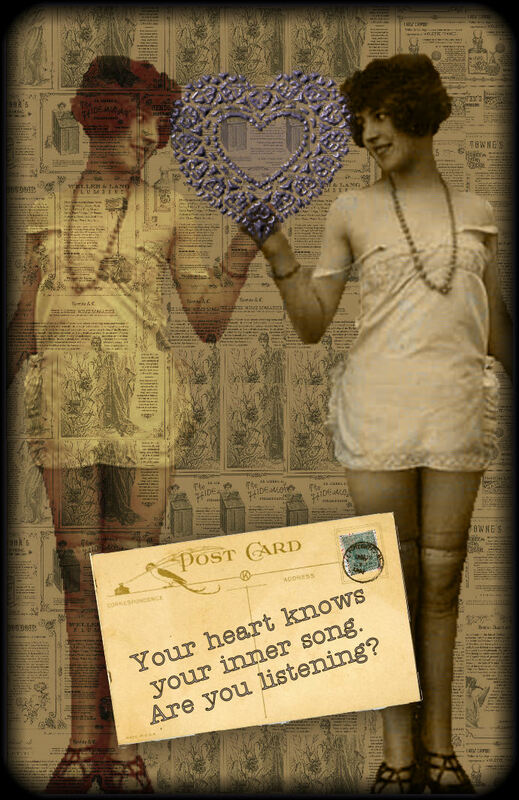 I came across the digital ATC above that I created at some point last year and had forgotten about. It stopped me in my tracks... then and there! I had to admit: "Nope, I haven't been listening." In my rush to get caught up with all the "stuff" that had languished around for months before and after my foot operation/recuperation, I was going flat out trying to do six months of backlog AND "new stuff" all at once! I wish now that I had kept all the sticky notes emblazoned with task after task scattered all over my desk and pasted to my monitor. It would have made a grand photo to show you! One thing became clear as I looked at them... I wasn't doing what was most important to me. It went a long way to explaining why I was feeling so out of sorts, why I was somewhat "grumpy" (not something I am prone to being), headachy and to top it all off, I was "bone" tired!! I gathered them all up and threw them in the trash. Boy did that feel "freeing"! Having broken the "spell" I was under, I began listening again. I soon discovered where my headaches were coming from. Working on the computer was giving me eye strain even though I was wearing my "regular" glasses. My eyes blurred up and my head pounded within a short period of time. I was scheduled for an eye appointment with the opthamologist in a few days so I'd ask her what was going on. As it turned out... nothing... my eyesight was perfect BUT my eyes were drying out sitting in front of the computer. According to the doctor, we tend not to blink as often sitting in front of the screen and should use eye drops regularly. She also suggested getting a pair of "office" glasses. These are glasses that are specially made for working on the computer. Off to the "glasses" store I went to pick out a pair of the funkiest frames I could find! Well ... what a difference putting in eyedrops regularly throughout the day and my "funky glasses" have made. Headaches have disappeared and I'm back in business (chuckle). If you wear glasses and work for more than an hour in front of a computer, I highly recommend them. So what have I been up to? The biggest chunk of my time has been spent on recording stories for a CD I will be releasing soon and hope to get on iTunes. What fun it has been! This is a project that I have been wanting to do for close to 12 years now and it feels great "getting on" with it. Yep, listening to my inner song is definitely working! During my "sitting around" time earlier this year, I decided to go through my file (upon file, upon file) of stories and choose my absolute favourites. With over 150 stories that I have gathered over the years, it wasn't an easy task deciding which ones I loved the most. But... I did manage to boil it down to 50... way more than I will ever need for a couple of CD's. The next order of business was figuring out how and where to put a proper "recording" area in our house.. When we lived in North Carolina, I had a recording studio built in our home but "lost" it when we moved back to Canada. But where could I put it in our current house? Over the past five years, I have filled up any available spot in my creative space with art supplies, paint, clay, fabric, beads, wire... need I continue? LOL. Add to that rolling carts, cupboards, fridge, oven (for baking clay) and a giantic art table! I wasn't about to give that up... no way!! It took some brainstorming, moving stuff around and a couple of "this won't work" tryouts but my new recording area finally found a home in a tiny corner of my creative space. Because I stand when I record, I don't need a lot of room to move around (other than for my "flying hands"). Hubby put together a tower to hold my microphone, snuggled it and the surrounding area in noise dampening audio foam, added a light, a spot for my laptop, a music stand and a high bar stool that I can straddle (I still have problems standing on my foot for any length of time). It's perfect! Very little ambient noise because I am in an enclosed space... a necessity as my microphone is very sensitive and picks up the drop of a pin! It's like being in a small "British style" telephone booth!. The only thing I need to do is turn off the fridge (which lives in a distant part of the room, as far away from the mike as we could get it). I forgot to turn it back on one day last week after I finished recording and had a tiny disaster... it defrosted and the water drained out all over hardwood floor! Now I have a sticky note on my laptop every time I record: "Remember to turn the &%"@* fridge back on." Nonetheless, I am a happy camper. Recording is just plain fun especially so when you can breathe life into a story you love. Stories just ain't for kids ya know! some beach time this weekend and then back to playing with story. Yep, life is good! 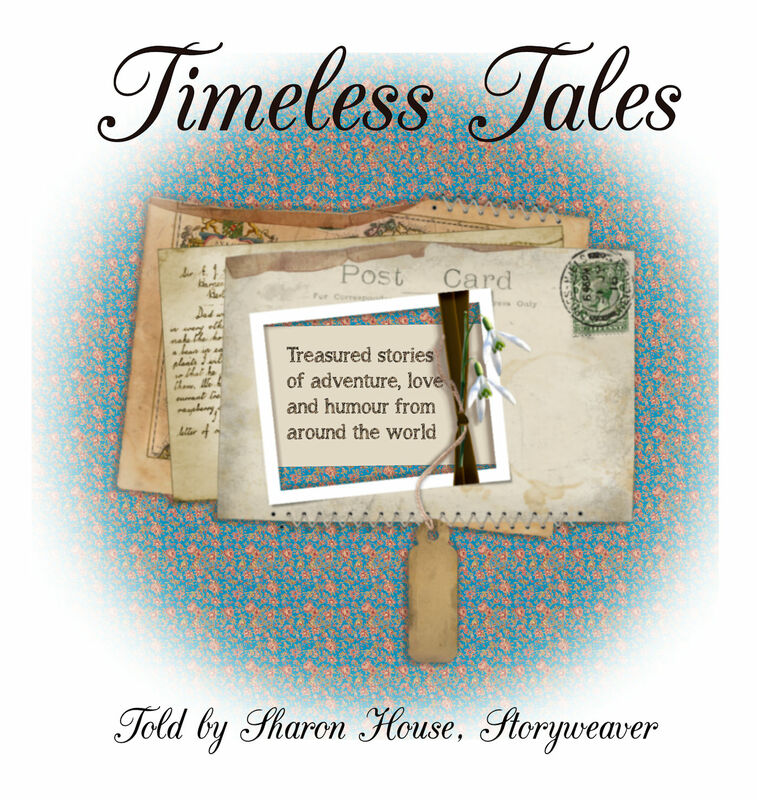 See you soon...next time I'll show you the CD cover I have designed for these wonderful "vintage" tales.